With summer (and my period) fast approaching, I've been on a quest to clear up my skin as quickly and painlessly as possible. 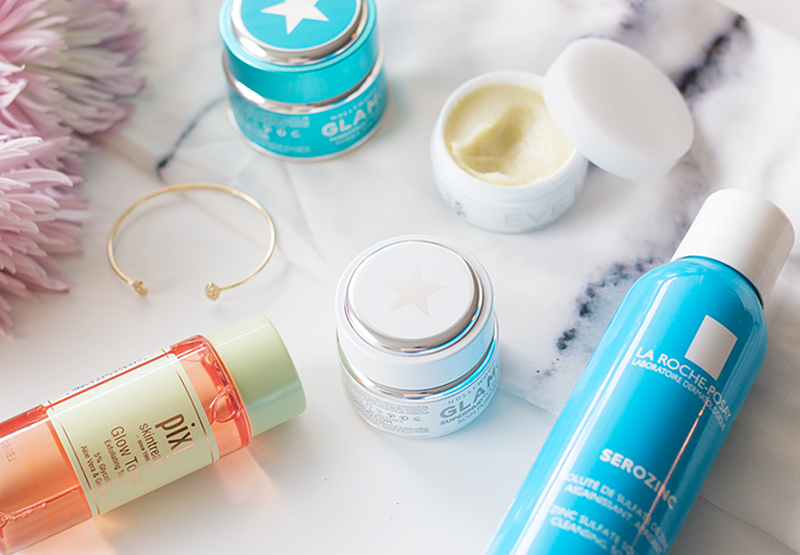 It's amazing what a few good products can do, but what I've really noticed lately is that good habits are really the best way to keep that skin of yours looking flawless. So with that in mind, here's are a few tips that have been working for me so far— I'm no expert, but I hope this helps! 1. KEEP IT CLEAN // This is the biggest "No sh*t, Sherlock" point, but one that goes deeper than you might think. I've washed my face everyday since the tender age of 12, but with environmental dirt and makeup comes deeper buildup that might be more than your cleanser can tackle alone. In order to get the deepest possible clean, and therefore clearer skin, I would recommend double cleansing. That could mean using a micellar water (I love Bioderma) followed by your favourite cleanser, or a lightweight cleanser followed by a thicker balm or oil one. Whatever method you choose, washing your face twice can go a long way towards making sure your skin is actually left clean and ready to absorb the subsequent steps of your beauty regimen. 2. EXFOLIATE // Whether physical or chemical exfoliants (like Pixi's Glow Tonic) are your jam, be sure to slough off dry, yucky skin once or twice a week while you're skin is on the mend. I really enjoy using both methods interchangeably, but figure out what works best for your skin and go from there — it's amazing what a good exfoliating session can do for the overall state of my skin! 3. PILLOW TALK // Something I never thought about before is just how important it is to change your pillow case regularly. Now that that's on my radar, I turn my pillow over each night until I'm ready to change the sheets, which for me tends to be every third night (but go with what works for you). If there's built up sweat and bacteria lining your pillows, you better believe that will be lining your face as well— not cute. And as an extra word of caution, be sure to use a clean towel each time you dry your face and avoid touching it too much throughout the day; again, bacteria. 4. CLARIFY // Every week— either as a spot treatment or all over my face— I like to use a clarifying face mask to help bring out impurities and calm down the overall state of my skin. For me, nine times out of ten that means Glamglow's Supermud Clearing Treatment, which I'll often follow up with a more nourishing treatment to prevent dry, peeling skin (which I also suffer from, big time). Treating acne can be a bit of a balancing act, so make sure to replenish your skin if you're going heavy on the clarifying front. 5. GET CLICHE // When it comes to a healthy complexion, following all those cliche bits of advice you've heard over the years can be a good rule of thumb. You know, dink lots of water; eat a healthy, balanced diet; and for the love of God, catch as many Zs as possible— beauty sleep is a very real thing, people!